It seemed to happen overnight and with little warning: Video gaming grew out of its awkward phase, emerged from mom’s basement and confidently launched itself onto the social media scene – winning the attention of millions of active and deeply engaged viewers in the process. With the help of streaming media technology and a virtually unlimited ability for consumers to build social communities around the things they love, massively popular video games like Call of Duty and League of Legends have been transformed from isolated youth activities into powerful and participatory online events. The new entertainment category these events have spawned – esports – is projected to reach $1.65 billion in market revenue by 2020, making it a lucrative playing field for enterprising marketers. Few social media platforms have done more to help brands capitalize on this booming entertainment trend than Twitch. In case you happen to be a n00b, Twitch began as a livestreaming video platform built around the interests of the gaming audience. But, as this passion-driven community grew, so too did the company’s view of its marketing value. Thanks to some savvy content partnerships with big media brands like the BBC, Disney Digital Network, and even the NFL, Twitch is expanding into other areas of streaming news and entertainment and now averages more viewers than many cable networks. 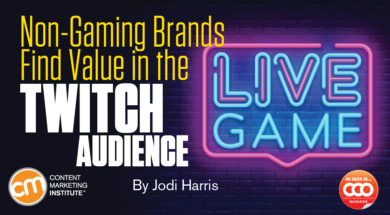 Jane Weedon, director of business development for Twitch, shares her insights on tapping into the huge audiences for livestreaming video for gamers without alienating the core fan base or losing brand identity. CCO: The Twitch community has expanded far beyond its initial audience of video gamers. How has your content strategy evolved in response? Jane: The content we support on Twitch is still tied to our community of enthusiastic gamers; but over time it has surfaced that they have a lot of additional interests aside from gaming, such as anime, vlogging, comedy, and the creative arts. Given the many different passions of our (content) creators, we are putting a big focus on providing better means of discovery to ensure their fans can easily find them, such as adding new tags, recommendations, and categories. CCO: On the business side, what makes Twitch valuable to its marketing partners? And, as you scale your offerings by continually adding new content partnerships, how can you protect this value from being diluted? Jane: Twitch has mastered the art of delivering live, interactive, shared entertainment on a global scale with a creator-focused approach. The result is a large and passionate fan community connected by chat behavior and emote-driven language (a meme-based pictographic shorthand) native to Twitch. In addition, our core demographic is the hard-to-reach, cord-cutting 18- to 34-year-olds who consume all of their content on laptops and mobile devices. The key to our success lies in seeing what streaming interests surface among our community and blending those with the content and our data. This ensures that our partnerships are aligned with our users. In general, the Twitch community is very savvy; so, transparency and authenticity are essential. We also offer a managed service to help brands understand authentic ways to communicate with Twitch communities, as well as identifying the most appropriate communities and streamers for brands to engage with. CCO: How does your team determine what content ideas to pursue through media partnerships vs. what community members might contribute organically on their personal channels? Jane: Content pursued through media partnerships is based on areas of interest surfaced by our community. For example, when we saw an affinity for anime, based on creators who were cosplaying as anime characters and playing anime-related games, we began streaming anime marathons, all of which have been well received. When things happen organically, like the TwitchPlaysPokémon channel, it is usually the community that first rallies around this content, which we, in turn, help amplify. An example of how this worked for brands led to a very successful branded campaign using the concept of chat-driven video: Old Spice’s Nature Adventure. Procter & Gamble unleashed an individual into the woods who had to perform actions dictated by Twitch chat, all to promote the Old Spice line of products. CCO: Are there opportunities for brand marketers to license and/or leverage Twitch content off the platform? Jane: Yes. A recent successful example is PepsiCo’s 7-Eleven Summer Series Presented by Brisk, (Pepsi’s brand of iced tea). PepsiCo took the concept of being an event sponsor to a whole new level by creating original programming to coincide with the release of a limited time product with exclusive retail placement. PepsiCo and Twitch created an off-season competitive gaming tournament for the popular video game Rocket League where the event’s commentators and personalities consumed Brisk and performed in skits about purchasing the product at 7-Eleven. Viewers not only cheered for shoutcasters (live gaming commentators) to consume bottles, they engaged with Brisk via social media after the broadcasts were over. They named their cars Brisk in the game, created videos speculating about potential Brisk-themed in-game car customization options, and took over the Rocket League subreddit with threads about Brisk. Fans in chat even created their own catchphrase: “Take the risk. Drink the Brisk,” which became the rallying cry for the whole event. This positioned Brisk not as just a brand name appearing in front of a broadcast but as an interaction point in the fan experience, a conversation piece, and a content provider. The key ingredient of success here was PepsiCo successfully identifying and incorporating into their messaging the style of organic fan interaction on Twitch and within the esports community. CCO: The nature of social video means that much of the content on Twitch will always be unscripted. Are there ways that brands can minimize the risks involved in engaging on a platform where anything can happen? Jane: In addition to Twitch’s robust community guidelines and terms of service, which are designed to ensure the site is welcoming to everyone, we provide a full suite of moderation tools and features to help channel owners mitigate inappropriate behavior in chat. Also, every channel has a report button with the reports monitored 24/7 by a global human moderation team. CCO: Social video is an evolving area where some content marketers may not have a lot of experience. What advice can you offer to help them measure the performance of their content activities on Twitch and maximize the impact of their engagement there? Jane: I’d suggest digging into user engagement data – going beyond minutes watched, clicks, and uniques. Twitch can measure viewer engagement via chat and the use of emotes – especially useful if a brand introduces a custom emote for a promotional stream. We also offer unique technical features like Extensions, tools that allow third-party developers to help channel owners customize their pages with interactive experiences via custom overlays. They can be directly integrated with live video on Twitch and will grow the unique relationship between creators and their communities, leading to higher engagement and more dedicated fans. Extensions can include polls, leaderboards, virtual pets, interactive overlays, mini-games, music playlists, game-specific tools, and more. These extra points of interaction, which any content provider can use, offer yet another type of user engagement data without altering any content. CCO: The gaming industry has a reputation for being less accepting of women participants, sometimes even openly hostile. How has Twitch ensured that the community is a place where female audiences can feel they belong? Jane: Twitch has a “welcome-everybody” philosophy, which is reflected both through internal and external initiatives. They range from participating in national events – such as Pride Month, Women’s History Month, and African-American History Month – to TwitchUnity, our annual site-wide holiday, and TwitchCon, where we have panels and organizations that deal with inclusivity and diversity. At our office, we’ve hosted Geek Girl Dinner and Glassbreaker events, which are both designed to empower women, and we’ve spoken at public events, such as Grace Hopper’s celebration of women in computing, where we also provided scholarships to two students majoring in computer science to attend the conference. CCO: What are you most excited about when it comes to Twitch’s future plans for engaging its community through content? Jane: For us, success is about seeing our creators succeed. The fact that on our service they can turn a hobby they are passionate about into a way to make a living creating unique content is hugely exciting. A version of this article originally appeared in the November issue of  Chief Content Officer. Sign up to receive your free subscription.